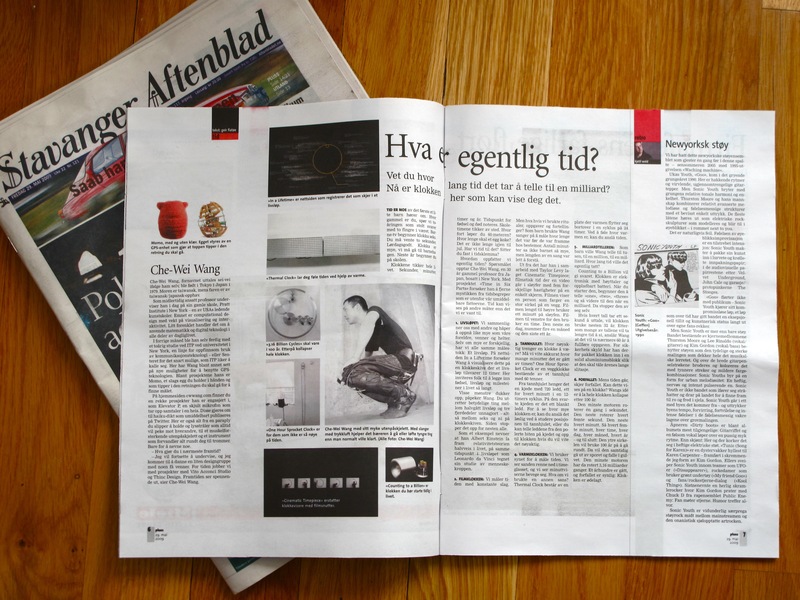 My ITP classmate Che-Wei Wang was profiled in the May 29, 2009 issue of the Stavanger Aftenblad, a Norwegian newspaper. ITP gets a shout-out, and ITP alumna Taylor Levy gets a specific mention too. I put my Swedish and Danish language studies to good use and translated the article into English. Sorry if it’s a little awkwardly-translated in places, but you can get the point. Che-Wei Wang, who pronounces his first name “sei-vei,” was born in Tokyo, Japan in 1979. His mother is Taiwanese and his father is of Taiwanese-Japanese origin. Today, he is teaching as an adjunct professor at his old school, the Pratt Institute in New York, one of the leading art schools in the US. His subject is computational design with a focus on visualization and interactivity. Simply put, it deals with using math and digital technology in all parts of daily life. In the preceding months, he had been preparing himself by studying at the two-year program at New York University’s ITP, a course for creative use of communications technology, or “the Center for the Recently Possible,” as ITP likes to call itself. At ITP, Wang has, among other things, researched new possibilities for the use of GPS-technology. One of his projects is Momo, a kind of egg you hold in your hand, which leans in the direction you should go to find your goal. On his homepage, cwwang.com, you will find a list of projects he as worked on, such as Elevator P., a hidden microphone that records conversations in an elevator. These conversations are then converted into haiku poems that are immediately published on Twitter. The sight also includes things from a hands-free umbrella and light beams that always point at each other to a muscle-enhancing exoskeleton and an instrument that converts everything around you into drums. And that is just to name a few. “I will continue to do research, and am going to form a little design group with a few friends. For now, we are working on a project with the Vito Acconci Studio and Thinc Design. The future looks exciting,” says Che-Wei Wang. Do you know how long it takes to count to a billion? Now we have a clock that can show you. Time is one of the first things a little child hears about. “How old are you?” we ask two-year olds, who proudly answer with two raised fingers. Children’s TV starts at 6 o’clock. You have to wait 2 seconds. Lørdagsgodt (TV program). It’s getting late. We have to go to day care. Next year we start school. The clock ticks all our lives. Seconds, minutes, hours, and days. The time of birth and death are officially recorded. Time ticks through our school hours. How fast can you run the 60-meter? How long does it take to cook an egg? How long is it until Christmas? Do we have time for that? Are you strained for time? How do we really perceive time? Che-Wei Wang, a 30-year-old professor from Japan living in New York, deals with that question. With the project “Time in Six Parts,” he attempts to demystify the concept of time, which lies outside of our immediate perception. Time can be shown in other ways than those we are used to. 1. The Road of Life: We compare ourselves with others and hope to accomplish as much as our parents, friends and heroes. Even if much is different, all have the same standard measurement: a lifetime (road of life). On the website, “In a Lifetime,” Wang attempts to visualize this on a clock face where a lifetime corresponds to 12 hours. He invites users to fill in birth, lifetime and other milestones in the course of one’s life. Wang indicates that certain patterns show up. You come up with meaningful things between halfway and three-quarters of a way through a lifetime – in other words, between six and nine o’clock on the clock face. Then it all stops for almost everyone. As an example, he references Albert Einstein, who came up with the Theory of Relativity halfway through his life, at the same relative time in life that Leonardo da Vinci sketched his studies of the human form. 2. The Film Clock: We measure time as a constant beat. But what if we used rituals, tasks and stories? As a child, Wang used songs to measure how it was to his grandmother’s house. Children don’t usually say the number of minutes, but the length of a song was easy to understand. He worked with Taylor Levy to make the Cinematic Timepiece, where cinematic time is a strip of videos playing at 5 different speeds on a single screen. The video shows a person painting a big circle on a wall. The video on the far right indicates minutes, the next one to the left indicates an hour, the next a day, the fourth one a month, and the last one a year. From the gear wheel hangs a chain with with 720 links, one for every minute in a 12-hour cycle. There is one shiny link in the black chain. To see what time it is, you can loosely estimate by studying the relative position on the gear wheel, or you can count the number of links from the polished piece on the chain up to the hour if you want to know the exact time. 4. The Thermal Clock: We use our vision to measure time. We watch the sand run down an hourglass, and we watch the second-hand on a clock in motion. What if we used another sense? The Thermal Clock consists of a heating element that moves over a 24-hour cycle. By feeling where the warmth is, you can estimate the time. 5. The Billion Counter: As a child, Wang wanted to count to a thousand, then to a million, and then to a billion. How long would that really take? Counting to a Billion seeks to answer that question. The clock is electronic, with a speaker and a rechargeable battery. When you start it, it begins to count “one,” “two,” “three,” etc., until it reaches a billion. Then it stops automatically. If every number takes one second to say, then the clock would take almost 32 years to reach a billion. Because many digits actually take more than a second to say, Wang estimates that it would take closer to 60 years for it to fulfill its mission. To be safe, he has packaged the clock in a solid aluminum block so that it can endure the years of wear and tear. 6. Decay: As time passes, things decay. Can this be visualized by a clock? Wang’s idea was to create an entire clock that would collapse after 100 years. The smallest motor makes one rotation in a second. The next motor once every five seconds. The next one every minute. And then every 5 minutes, every hour, every day, every month, every year, etc. The outermost circle takes 100 years to make one rotation, and at the same time, it will come out of its track and fall on the floor. The smallest motor will have rotated 3.16 billion times. A century has passed and decay is clearly visible: the clock has self-destructed. Momo, with and without clothing. The egg is controlled by a GPS unit that makes the top lean in the direction you should go. “In a Lifetime” is a website that registers what happens in a lifetime. “Thermal Clock” lets you know the time with the help of heat. “3.16 Billion Cycles” will take place in 100 years. After that the whole clock collapses. “One Hour Sprocket Clock” is for those who are not so good with timeliness. Che-Wei Wang with his soft exoskeleton. With tubes and pneumatics, it helps the wearer to lift heavier things than he could normally deal with. “Counting to a Billion” is the clock you must start early in life.